My friend Melodie Bolt posted a thing on Facebook about how she was going to write at least one page a day in August. That seems okay. I mean, it's a page. It doesn't have to be good, right? As it happens, I'm having a little bit of a problem getting stuff on paper lately. I mean, the summer's been great, and I've been selling books--no, I know I ALWAYS sell books, at the book store, but this time I'm selling my book. That's weirder than I had anticipated. Great, but weird. But I've had problems concentrating lately. After Black Light, I couldn't find my way back into my actual work in progress. This week, though, was my annual trip to Gilchrist Retreat Center with my oldest best friend, Loren Rhoads. I was really looking forward to it, but.... I was really scared that I wouldn't write anything. The first day went badly. I couldn't stop thinking about bills that waited at home, about work, and general crap that was stacking up. I was so stressed that when I sat in my little cedar back porch with my notebook I kept falling asleep mid-word. Maybe I was starting to get Alzheimer's? I couldn't keep any thoughts in my head. I went out, took pictures of butterflies and decided that I was done with writing. Luckily, Loren brought a bottle of wine over, and talked me out of that. And told me where to go next in the book. Thank Goodness. I'm not done. And of course, Gilchrist is my favorite place to write, it's so beautiful and peaceful. I feel like I can breath there when sometimes it's hard to in the world. So.... Remember what I was saying about Melodie and the page-a-day challenge? I said, hey, me too, almost without thinking. I mean, the pages in my notebook are pretty little. How hard could it be? I better make it harder. Well, not for me, exactly. So here's what gonna happen. I'm going to write a page a day.... Well hopefully more than that. And I'm going to pick out three of them a week and stick them up here, as well as into the book. No, not every one of them. That would be crazy. But I can do three. So I'll see you next week. One the the weird/cool things that has happened since the book came out is that people have asked me a whole bunch of questions that I don't usually get. Okay, I'll be honest, nobody's ever asked me anything about what write before. I did, over the last month, a series of interviews about Black Light, and about writing in general. I thought I'd put the links in below. Shels Walter asked me about nail polish, and music. Coreena McBurnie wanted to know, pants or plot. I bet you know which one I chose, right? Fiona McVie let me talk about religious experiences. And Terrie Leigh asked me about the nature of writing. Also I was interviewed by the Flushing View, which is my home town newspaper. This, out of anything else I've done in my life would have made my mother proud. Oh, hey, and my writing group, Flint Area Writers, has a swank new website, created by the amazing Melodie Bolt. You should totally go look at it and find out what the rest o FAW is up to. So that was my June. July started with the signing, which I may have mentioned, at my B&N, and it's going to end with a trip to Gilchrist with my oldest best friend, Loren Rhoads, for writing and wine an lots and lots of quiet. I can't wait for that. This has been weird. I have been to signings before, sat next to my friends while they signed their books for people. 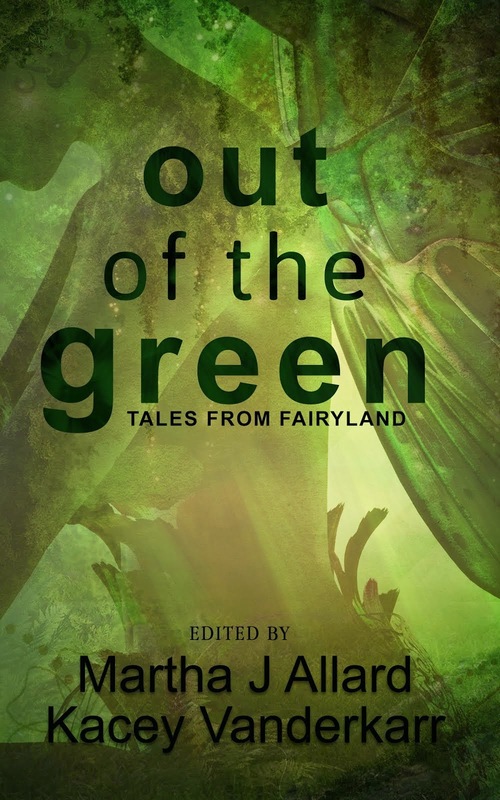 I've even signed my name to an anthology or two that I've had short stories published in. Today was different. Today I got to sit at the table at the Barnes and Noble put Black Light into other people's hands, all day. It was great. But weird. But great! With me are Kacey Vanderkarr, Brian Thomas, and AJ Tupps. What great company to be in. I saw a couple of old friends, which was amazing, and make a whole bunch of new ones, and even recruit a few for Flint Area Writers! And!! You guys! 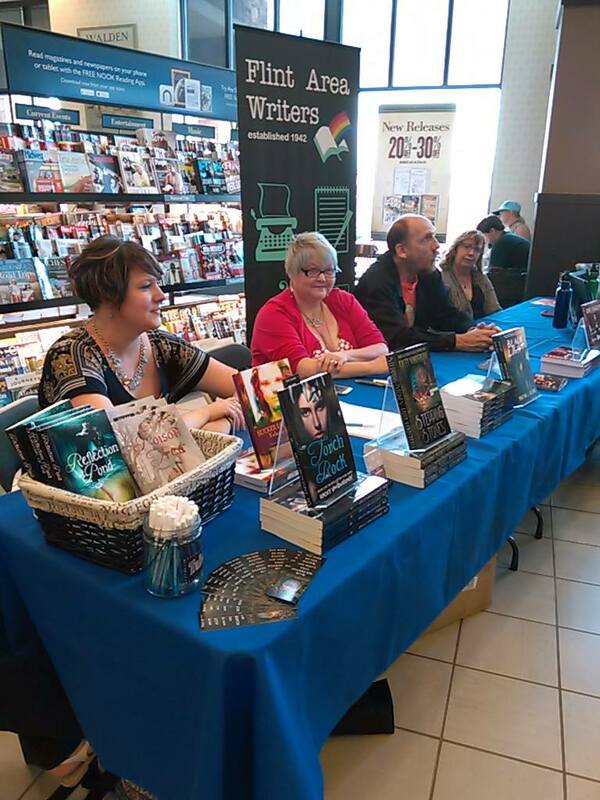 I even got to sell the book to people who were complete strangers! How much fun is that! So, in celebration of my first signing, I'm doing a Goodreads Giveaway, starting at midnight tonight. ( July 9th). 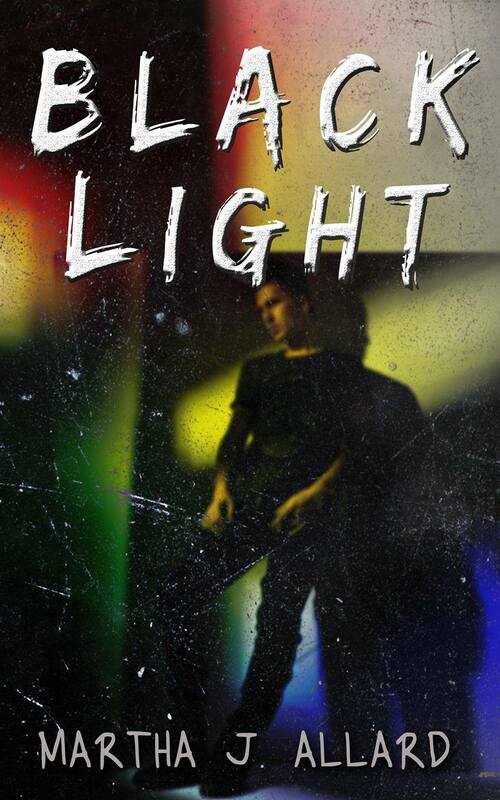 You can enter to win one of three paperback copies of Black Light from now until July 31. Anyway, just click on the link over to the right of this blog, okay? And go enter!